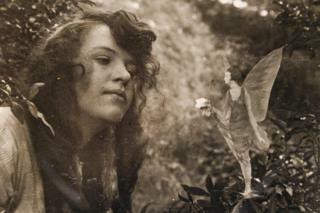 A series of the famous faked Cottingley Fairies photographs has sold for more than £50,000 at auction. The pictures were taken in 1917 by 16-year-old Elsie Wright and her nine-year-old cousin Frances Griffiths in the village of Cottingley, near Bingley in Yorkshire. The hoax fooled many people including Sherlock Holmes author Sir Arthur Conan Doyle. Chris Albury, auctioneer and photography specialist at Dominic Winter Auctioneers, said some of the latest batch of photographs had come from Catherine Lynch, the daughter of Frances Griffiths. One of the most desirable pictures, Frances and the Fairy Ring, a print from the original negative, did not sell. Catherine Lynch said: "There was no problem - they will go back in the safe again. I'm rather surprised, I must confess." Two of the photographs were auctioned by Dominic Winter for more than £20,000 in October. The girls borrowed Elsie's father's camera, and used coloured paper cut-outs and hatpins to stage their scenes, near the stream at the end of Elsie's garden. In 1919, Elsie's mother Polly Wright took prints of two photographs to show members of the Theosophical Society in Bradford. Leading society member Edward Gardner asked photography expert Harold Snelling to produce prints of them to be sold at Gardner's theosophical lectures in 1920. The pictures then found their way to keen spiritualist Conan Doyle, who was writing a magazine story on fairy life. The sale was held by Dominic Winter Auctioneers in Cirencester, Gloucestershire.